Mike Fiers gave Oakland another stellar start and beat Chris Sale. OAKLAND, Calif. — Ramon Laureano didn’t have time to think. Luckily, he had arm strength and adrenaline aplenty to help get the job done. 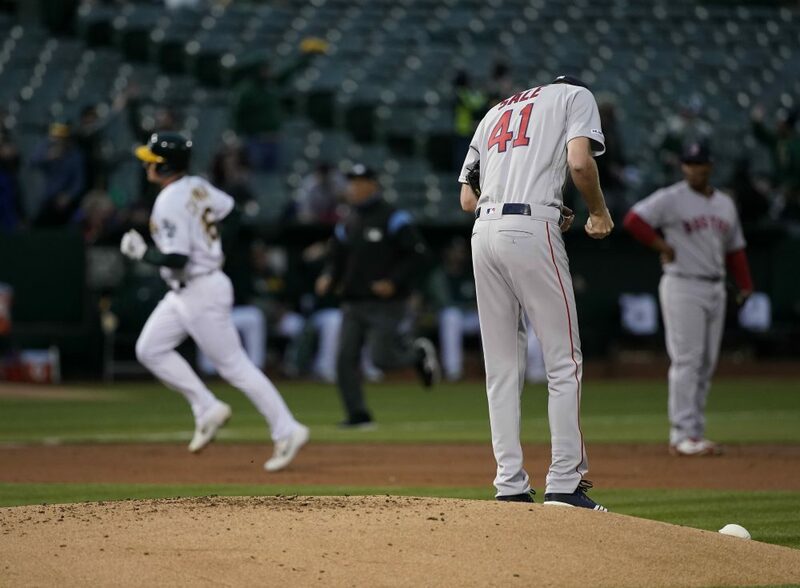 Mike Fiers gave Oakland another stellar start, Laureano threw out a baserunner for a second straight game and the Athletics made Matt Chapman’s homer stand in a 1-0 win over Chris Sale and the Boston Red Sox on Tuesday night. With one out in the top of the ninth, Xander Bogaerts drove a ball off the wall in right-center, well over Laureano’s head. The center fielder chased down the carom, picked it up with his bare hand and whipped it to third base, delivering a one-hopper that nailed Bogaerts trying to stretch his double and helped closer Blake Treinen lock up his third save. Laureano threw out Bogaerts at home in the second inning of Monday night’s 7-0 A’s win against Boston. Laureano has 11 assists in 56 career games, and Tuesday night’s throw ranks among his most sensational. “Given the situation, that’s probably the best one that we’ve seen him make,” A’s manager Bob Melvin said. The World Series champion Red Sox dropped their fourth straight and fell to 1-5. The five hits were the most an A’s starter has allowed during this dominant run. Starters had given up three or fewer hits in each of the previous five games. Sale was coming off a lousy opening day start in which he gave up seven runs in three innings in a 12-4 loss to Seattle. The seven-time All-Star settled down, covering six innings while throwing three-hit ball. Ryan Buchter and Lou Trivino combined on two innings of one-hit ball. SHORT HOPS: Red Sox DH J.D. Martinez singled leading off the second inning to extend his hitting streak to six games. … A’s SS Marcus Semien had his hitting streak snapped at seven games. Red Sox 3B Rafael Devers made a diving play on a grounder to rob Semien of a hit with one out in the fifth. … The Red Sox are 15-37 in their last 52 games at Oakland and are 3-12-1 in their last 16 full series there. … Treinen extended his scoreless inning streak to 24 dating to Aug. 25. Red Sox: 2B Dustin Pedroia (left knee inflammation) played nine innings in an extended spring training game in Fort Myers, Florida. The four-time All-Star had four at-bats and made some diving plays at second, manager Alex Cora said. Athletics: 1B Matt Olson, who had surgery on his right hand on March 22, had stitches removed Monday and took some ground balls Tuesday, manager Bob Melvin said. Olson will start a strengthening program soon, but no timetable has been established for the Gold Glove first baseman’s return from surgery that involved a right hamate excision. Red Sox: RHP Nathan Eovaldi (0-0, 10.80 ERA) gave up six runs and eight hits, including three home runs, against Seattle in his last start March 29. Athletics: RHP Marco Estrada (0-0, 2.45) tossed six shutout innings against the Angels in his last start March 29.